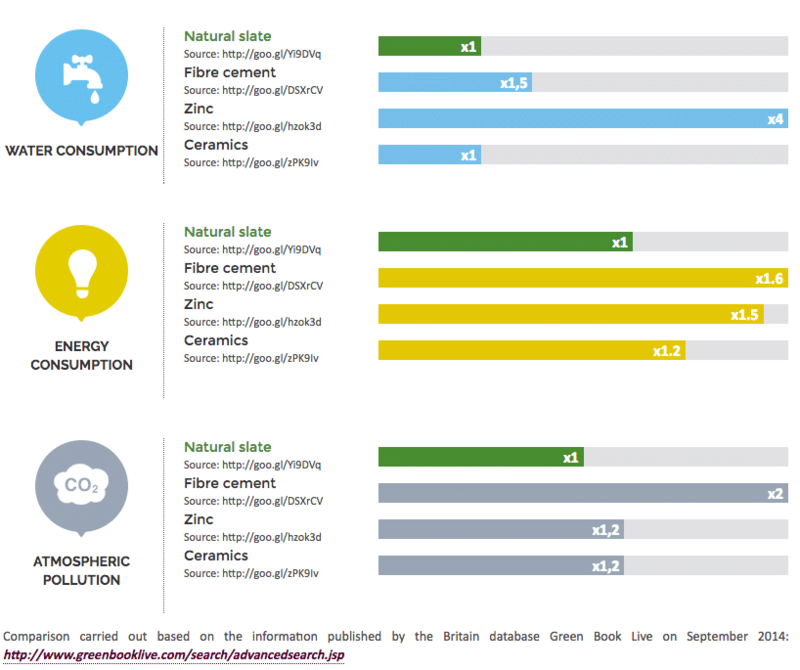 As a natural choice among green building materials, natural slate offers many eco-friendly advantages to architects and builders seeking ways to improve environmental sustainability in modern building designs. Natural slate offers an economically competitive, totally sustainable alternative for roofs and cladding. Conducted by independent international studies, natural slate has been recognized for producing the least negative effects on the physical environment. No artificial materials, chemical products, or furnaces burning fossil fuels are needed to extract and produce natural slate, so the production processes are very simple and sustainable. Substantially reducing CO2 emissions into the atmosphere, life cycle analysis confirms that natural slate is an excellent ecological option for any sustainable architecture project. With 16 quarries located in the Northwest of Spain, CUPA PIZARRAS is a global leader in slate, working with the largest tectonic natural slate reserves in the world. Using top of the line production and quality controls, CUPA PIZARRAS offers unique, world-famous natural slates that meet or exceed all international standards. Offering lightweight, easy to install solutions, CUPACLAD® ventilated facade cladding systems can be adapted to every architectural design. Whether in renovation projects or in new construction, CUPACLAD® rainscreen cladding brings sustainability with an elegant and sophisticated look and feel. By combining CUPACLAD® rainscreen cladding systems with an insulation layer, temperature losses in a building are minimized due to slate’s naturally low heat transfer coefficient. This combination of a rainscreen cladding system with an insulation layer provides many natural eco-friendly advantages. Consisting of a load bearing wall, an insulation layer, and natural slate as a covering material fixed to the building, the resulting system offers both thermal and acoustic advantages, as well as avoids thermal bridges and condensation buildup. Considered the most efficient system for construction envelope applications, the gap between the cladding and the insulation creates an air cavity that receives constant air circulation through an efficient, natural convection process. Warm air inside the air cavity rises and is released to the exterior, along with any humidity present, creating a continuous cycle of ventilation. This “chimney effect” of continuous ventilation is considered one of the biggest natural advantages of a ventilated facade. And, by choosing CUPACLAD® natural slate rainscreen cladding systems, your building project will benefit from the most environmentally sustainable solution for thermal insulation. ENERGY SAVINGS — Thermal efficiency is increased due to the cooling effect in summer and greater heat retention in winter. STRUCTURAL MOVEMENT REDUCTION — The air cavity avoids temperature variations resulting in less pronounced structural movements. This reduces the risk of cracks and other structural issues. ELIMINATION OF HUMIDITY — Rainwater penetration is greatly reduced and any moisture is removed through the constant ventilation, reducing the risk of any condensation. DURABILITY — The cladding material is kept dry due to continuous ventilation. Many issues related to humidity (efflorescence etc…) are reduced resulting in a longer lifespan of the installation. 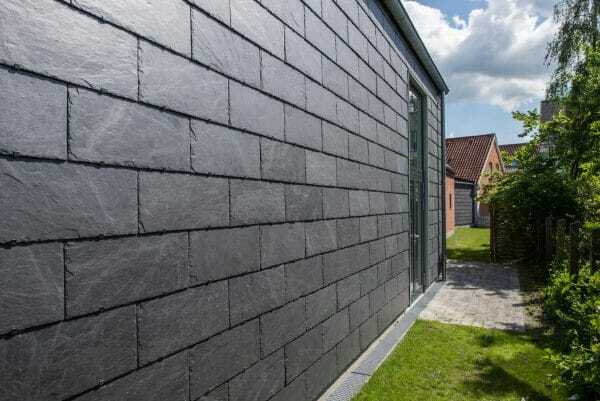 In addition to offering your home or building all of these eco-friendly advantages, slate also naturally enhances the timeless beauty and aesthetics of any wall or surface it is applied to. Blending modern designs with sustainable architecture principles, CUPACLAD® rainscreen cladding systems offer energy efficiency with eco-friendly natural slate. With a clear focus on reducing energy consumption and CO2 emissions, CUPA PIZARRAS’ commitment to the environment shows in the products offered and in the production processes utilized to make such beautiful natural slate available. This post was sponsored by CUPA PIZARRAS Slate Company; all images from CUPA PIZARRAS.